There is great wisdom in that old phrase “safety in numbers”, and it certainly holds true for dating. When you are meeting a possible new romantic partner for the first time, or are still just getting to know this new person, you can feel very vulnerable and exposed and you can also be manipulated into doing things that you might not normally do (both by yourself and others). A great way to relieve some of the pressure and make sure that you don’t do anything you will regret is to have some of your friends around for backup. Group dates are a fantastic idea for staying safe, having fun and getting some quality time in with a number of the important people in your life. Just remember though, group dates can only be as safe as you make them. Sometimes in the interest of safety, particularly with blind dates, people arrange double or group dates with the idea that if things go well they can always break off into a comfortable couple later. Don’t do this. Vow to stay together with the group for the entire date and actually do so. Breaking away into a smaller group may seem intimate and romantic, but it also means that you lose all of the safety benefits – extra eyes, extra ears, etc. – that you gained in arranging to be with a group. You also lose the others’ moral support to engage in only the activities with which you are comfortable. Still feel like making the group a little smaller? At least do so by quietly conversing in the corner rather than leaving the group’s location all together. Much like staying with the group gives you the added protection of your other friends, keeping the group in a public setting gives you the added protection of total strangers. In the event that anything untoward does happen being in public means that a greater number of objective witnesses will be there to both act in your defence and report whatever happened at a later time. Staying in a public place also reduces any pressures that might come with being in a private home, and since everyone needs to obey the laws in public places there is less worry that anyone in the group will act in a potentially harmful way. Besides, if the date turns out to be a real dud then at least you’ve got multiple exit strategies in a public place. It can be easy to lose your head when a potential romantic partner seems perfect, in fact this is usually celebrated as being swept off your feet towards happily ever after. Unfortunately, in the 21rst Century world everyone needs to be a little wary of knights in shining armour and fair maidens that seem to work magic. Even if no one else on your group date seems to be paying much attention to you and your new romantic interest, rely on yourself to make smart decisions. Try to stay sane and think clearly at all times and always think through a couple of steps ahead of whatever actions you are considering. That last drink at a quiet bar might seem fun now, but do you have enough call credit to call for a taxi, do you have cash for the taxi home and do you even know the address and phone number of your potential new location? If you can’t answer any of your own questions then let that be a warning that you should not be engaging in the activity. Group dates are not just for giggling pre-teens, they are a smart way for adults to ensure their own safety when they are meeting with someone new. 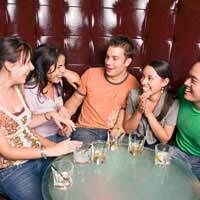 To make the most of the extra safety offered by a group date, be sure to stay together with the group, keep the group in a public location and keep your wits about you before you do anything that you might regret later.